"Some of the tightest, smoothest, sexiest soul and funk produced in the city right now comes courtesy of six guys who all grew up within a few blocks of each other on Vancouver’s East Side." The Boom Booms are an Indie Soul band from Vancouver, BC. 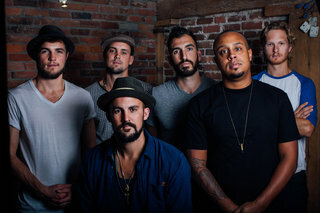 The group consists of brothers Aaron Ross (lead vocals) and Sean Ross (keys), Tom Van Deursen (guitar), Geordie Hart (bass), Richard Brinkman (drums), and Theo Vincent (percussion, drums). The Boom Booms love and live for the road. They've busked across Europe, performed in the Brazilian Amazon and Rio's famous 'Casa Rosa', toured in a Scamper RV the 12,000 km roundtrip from Vancouver to Panama and circumnavigated the United States twice in their yellow School Bus. Influenced by travel the Booms released their latin-laced debut album ¡Hot Rum! in 2011. The band went on to win 2nd place in the PEAK Performance Project 2011, taking home a prize of $75,000. The Boom Booms have been voted the best unsigned band of Vancouver (The Georgia Straight) 3 years in a row. Their sophomore release produced by Grammy Award-winning producer Chin Injeti "Love Is Overdue" draws on childhood influences such as Bill Withers and Al Green. The album was released on October 4th and has been well received locally. The Boom Booms recently hosted their first music festival in Vancouver on July 5th. An evolution of the band's charity block parties that began in 2009, the East Van Summer Jam is The Boom Booms’ way of giving back to the borough that raised them. Proceeds from the fundraiser, which also featured the Rascalz, the Funkhunters, and the New Royales, go to the band's nonprofit, the Music Tree. In past years, the Music Tree has donated money to organizations like the Vancouver-based CLICK (Contributing to Lives of Inner-City Kids) and the St. James Music Academy, as well as numerous international charities.